I love that joke but “surely not” was my response when John Troyer’s email popped into my inbox this morning. Since that time I’ve had a veritable deluge of congratulations from all quarters. 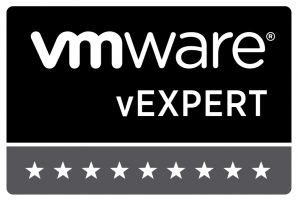 Along with the award itself that means a lot to me so this is a big public thank you to everyone really, especially John Troyer and vExpert panel. Obviously the bar has been set now. Time to get my bottom in gear.